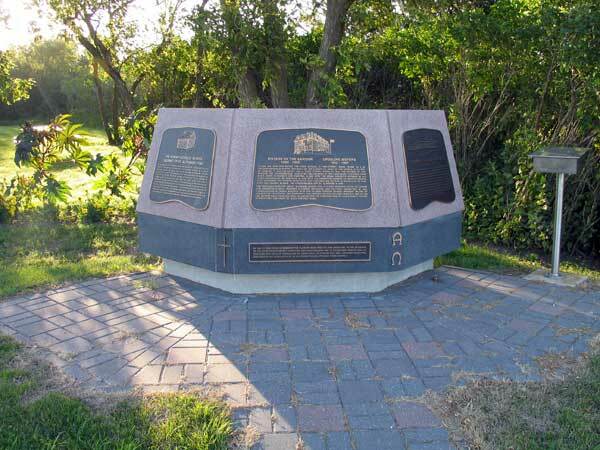 This monument in the village of St. Alphonse, in the Rural Municipality of Lorne, was dedicated on 2 July 2000 in commemoration of the students, parents, sisters, priests and lay teachers of the St. Alphonse schools. St. Alphonse School No. 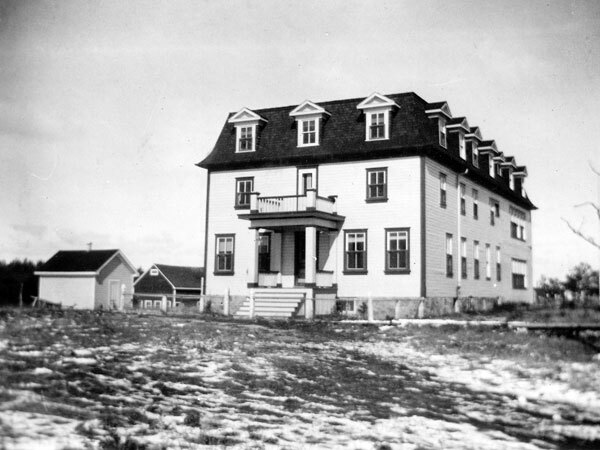 1001 was established in 1883, on land donated by Jules Poirier and Louis Vendette. The settlers constructed a log building to serve as a priest’s residence, chapel, and school. The next year, Phelonise Chapdelaine, the first teacher, had a class of ten students. By 1885, increasing population prompted the construction of a new two-storey building, at the base of the hill, housing the primary school, boarding house, and parish hall. Odele Bedard took over as teacher at this time. The fee to board at the school was $2 per month, usually paid with produce, wood or flour. He was replaced in 1899 with the Sisters of the Five Wounds of the Saviour (Chanoinesses Regulieres des Cinq Plaies du Sauveur), who were invited to take charge of the school and start the first convent. Two thirds of the children were French, one third were Flemish, but French only was used in the beginners’ class. The school building was destroyed by fire on 27 February 1903 and classes were held in the rectory for seven months. After the fire destroyed the first school, a two-storey wood frame building, 34 feet x 38 feet, was erected west of the church by the Cusson Company, at a cost of $6,200, for use as a convent boarding school. It was enlarged and a third storey was added in 1916. The Sisters of the Saviour, the “Chanoinesses”, educated the children in two languages, teaching them music, home economics, and painting along with the usual subjects offered in all other schools of the province. In 1930, with the diminishing number of French families in St. Alphonse, the sisters negotiated with the Ursuline Sisters of Bruxelles to take over the convent school. The Chanoinesses left St. Alphonse in 1932. The Ursulines directed the St. Alphonse School for 35 years, offering to the villagers and boarders a well-rounded academic, religious, and cultural education. In 1959, consolidation of rural schools with the village convent school brought an era of change for the school and community. The convent school became obsolete and, in 1964, the Sisters sold their building, allowing for the construction of a new public school in which they continued to teach for two years. Following the Royal Commission on Education in 1957, the St. Alphonse Consolidated School No. 2371 was formed in January 1959, with the addition of the surrounding rural districts of Campeau School No. 1418, Grange School No. 892, Thor School No. 1430, and part of St. Albert School No. 2164, St. Urbain School No. 903, and Bru School No. 368. Mountain School Division No. 28 was established on 1 April 1959. The consolidated school district of St. Alphonse became part of this Division but the local school board, composed of five trustees and a secretary-treasurer, retained control of the elementary school. In 1964, a new three-room school was built by Gotthard Peterson Construction Company. In 1967, St. Alphonse School had its first lay teaching staff in 68 years. “School of Choice” policy affected enrolment and the doors of St. Alphonse School closed on 28 June 1996 for the last time. GR8461, A0233, C131-2, page 38.